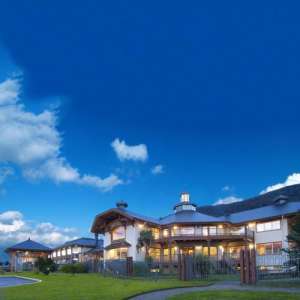 Loberías del Sur Hotel is located in Puerto Chacabuco, in the core of the Chilean Patagonia, close to Laguna San Rafael, this is the perfect place to return after a day full of adventures. 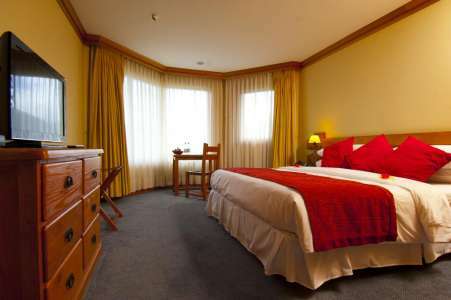 It counts with excellent traditional-style rooms, warm and cozy, full equipped with heating, private room and other amenities for the best relax of the guests. 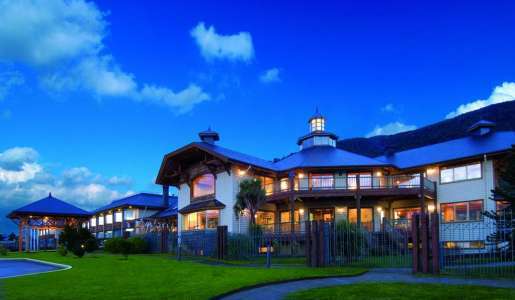 The hotel also has the exquisite Chucao Restaurant, where the passengers will enjoy of the delicious Patagonian food, and its typical lates such as seafod and lamb, with the company of a delicious drink or a chilean wine, watching the southern landscape of the zone. Loberías del Sur also offers gym, tempered swimming pool, sauna, coffee shop, games for children and other services. It counts with convention rooms for events and business center, full equipped with computers and wireless Internet. Number of rooms:> 60 rooms. We went here with the intent of getting on the cruises to San Rafael that the hotel hosts. After arriving, we were told that there were not enough people that signed up for the weekend and that the tour was cancelled. This was the primary reason for us going here. The location in Chacabuco is very remote, and there is nowhere to go in the town unless you take a car or bus to leave. The restaurant is quite poor, the service is almost non-existent, and the food is a complete failure. If you''re stuck there with no way to leave, it is quite terrible. Muy buena ubicación con vista al agua y las montañas, edificacion en excelentes condiciones. Excelente trato de parte de todos y cada uno de los empleados del Hotel, desde las mucamas, los guias y los choferes. Excursiones a tiempo, y autobuses en excelentes condiciones. SIn ninguna duda recomendaríamos este hotel. No es malo, SON solo comentarios. 1) La cena de buffet para 3 de 4 noches de estadia, tal vez se podria mejorar o cambiar por menu. 2) al contario de otros hoteles, NO se nos entrego un schedule de actividades a la llegada del hotel. Debo aclarar que NUNCA nos falto esa información, solo que nunca la recibimos por escrito, solo el primer dia lo tuvimos y fue impresa a pedido nuestro.